Applying the methods and ideas espoused in his popular book Choice Theory, world-renowned psychiatrist and relationship expert Dr. William Glasser, along with his wife, Carleen, offers a practical guide to an enduring, satisfying, successful marriage. 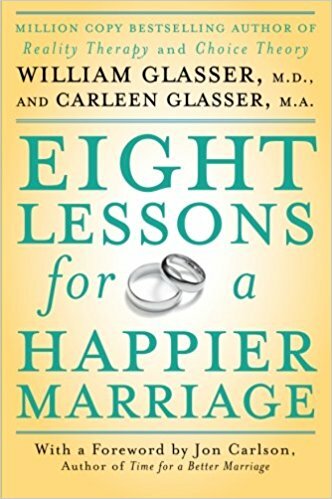 Eight Lessons for a Happier Marriage showcases eight real-life histories of troubled couples and presents simple, practical solutions to overcoming the pitfalls illustrated therein. Keeping love alive and strong is not as difficult as you think; let the Glassers and this indispensable book show you how!